Abstract: The topics covered in Analytical Chemistry 2.1 (see TOC on right) include those common to introductory, undergraduate courses in analytical chemistry with an additional emphasis on topics such as sampling and method development. The textbook’s art work includes illustrations and photographs, all in color, which are available separately either as .png or as editable .ai files. New to this edition of Analytical Chemistry 2.1 are contextual case studies that illustrate topics covered in the textbook. Each case study is available in two formats: a text file that faculty can use as is or modify to meet local needs, and a web-based version that allows students to interact with the case study’s data using figures created with Plotly (https://plot.ly/). Each case study includes an Instructor’s Guide, which provides additional background information and suggested responses to the case study’s investigations. Also new to this edition of Analytical Chemistry 2.1 are materials developed for use in the R programming environment (https://www.r-project.org/), including functions and packages for generating figures and for simulating data, and learning modules built using the R Shiny package (http://shiny.rstudio.com/). 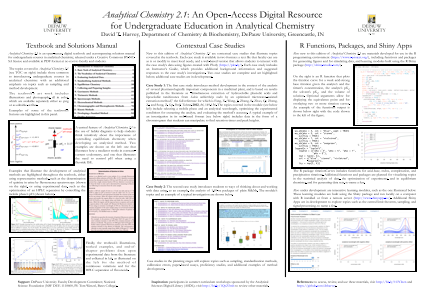 Summary: Analytical Chemistry 2.1 is an open-access, digital textbook and accompanying solutions manual for undergraduate courses in analytical chemistry, released under a Creative Commons BY-NC-SA license and available in PDF format at no cost to faculty and students.